About 25 years ago I was delighted, though a little surprised, to discover that the old chap I’d seen inching his way along Northdown Road in Cliftonville, wearing the thickest black coat on the hottest day of the year, was in fact the son of actor Will Hay, one of my favourite film comedians. Will Hay Jnr was living at the Teviot Care Home in Crawford Road at the time, and regularly made his way to the Bellevue pub at the end of each week for a couple of pints of Poachers ale. I couldn’t wait to introduce myself. “Yes… and I still am,” he announced with a twinkle in his eye and the same square jaw as his famous begetter. Here began an unexpected friendship. Over the coming year, I’d often buy him a pint on a Friday and he would return the favour, toasting​ both rounds with these words, “Never above you… never below you… always on the level,” his recital punctuated by our clinking glasses. Bill was an ‘old school’ gentleman. If Gladys (or any other lady) stopped at our table, he would respectfully stand. Bill was a joy to talk to. “Aren’t you hot in that coat?” I asked. During the 1930s, Billy’s father was one of the country’s biggest box office draws. Prior to this he had been a successful music hall artiste, touring his stage show extensively. The act comprised of an unlikely trio; an incompetent schoolmaster who battled with a cheeky ‘know it all’ schoolboy and a toothless old man. In 1921, Hay (born in Stockton, Cleveland) moved to Ramsgate with his wife and three children, choosing a house in Guildford Lawn before favouring a larger property in nearby Hollicondane Road. The family also lived in Codrington Road for a while. A blue plaque above the Regency style terrace in Guildford Lawn acknowledges that Hay was also an astronomer. In fact the comedian was far more interested in looking at the stars than being one and constructed his own telescopes. After making national news by discovering a white spot on Saturn in 1933, he published a highly informative book on his hobby called Through My Telescope. “Off screen, he wasn’t funny at all,” Bill remembered. In contrast to his bungling screen persona, the actor was supremely intelligent and highly versatile (he spoke several languages, could ‘loop the loop’ in a plane and spar with the best of them in a boxing ring). His school record shows that after his education he joined his father’s act and did indeed travel south of the equator with the troupe. Initially, young Billy was reluctant to enter the family business. He recounted the time he’d been presented with a script at the tea table one evening and ordered by his father – in a typically strict and serious tone – to learn it. “Why do I have to learn it?” he complained. The schoolboy’s impulsive response was to run away to sea. Now living in Streatham, he got as far as the East London docks where he was picked up by the police. Billy was just fourteen when he appeared alongside his father at the London Coliseum in a Royal Command Performance watched by King George V (a huge fan of the act). 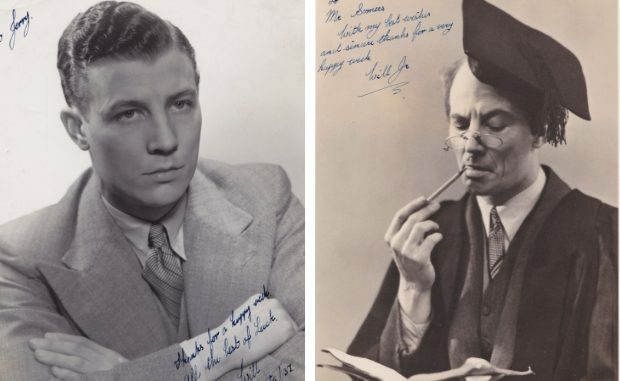 By 1937 he was in front of the cameras, playing Clarence in the classic Gainsborough Pictures movie, Good Morning Boys, with regulars Moore Marriott, Graham Moffatt and future Carry On star, Charles Hawtrey. The films had become hugely popular, so with help from his father, Bill took over the stage act, donning the mortar board to assume the role of schoolmaster. His team got ‘belly laughs’ at venues up and down ​the country. “Sometimes my mother stepped in to help out when we were short and played the old man,” he said proudly. When war broke out, the thwarted sailor thought he would finally get to go to sea if he joined the Navy. He only ever spoke of one regret. When his parents separated after Hay had an affair, it divided the family. Bill naturally sided with his mother and never really forgave his old man. Hay died in 1949, with the rift still unhealed. Bill passed away in October, 1995. During the funeral services​ in a chapel at Margate cemetery, a small congregation heard how he liked to complete crosswords and feed the birds. There was no mention of his time living in America, and how he’d had drinks in a bar with a total stranger who turned out to be gangster Al Capone. How he signed for MGM on the same day as his good friend Red Skelton. Or how he played ice hockey at Streatham Ice Rink to a high standard. Events which never​ would have happened if it wasn’t for Bill’s miraculous recovery from an illness during his time in Ramsgate. Doctors had prepared his parents for the worst after the young lad developed tubercular peritonitis. “I shouldn’t really be here at all,” he reminded me from time to time. But Billy pulled through and went on to live a truly remarkable life. The world is certainly richer for it.